Surprisingly, March 2013 was a good month. 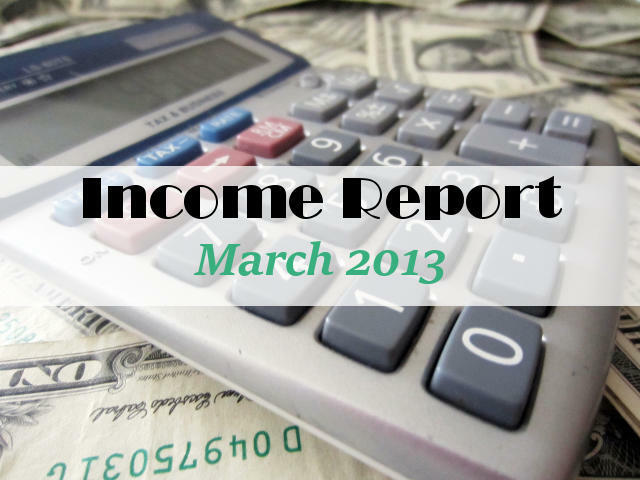 If you read my February Income Update you will see that I earned $837.08 and expected this to remain a long-standing record, and was scaling back my advertising coverage and efforts in March. Despite spending only a fraction of the time looking through adverts, selecting them for my sites and promoting various products through affiliate links, money continued to come in without much effort. I put this down to the length of tracking cookies from ShareASale in particular. A reader may have clicked a link in January or February but I was still getting commission in March from that click. I also had a full month of Adsense earnings this time. Logic Media – $0.20 Account to be closed, not the right fit for me. CPADNA ads – $0.00 – account closed. Didn’t work for me. Media.net ad box – $0.00 – account closed. Didn’t work for me. In addition, I received goods to the value of $175 for sponsored posts. How was this distributed between So Sew Easy and here at Moms Make Money? Beware of spreading yourself too thinly. Because I was trying out everything and everyone to see what offers they had and what worked best for me, I did spread my advertising efforts very thinly. This results in low earnings over a number of schemes, when it would be better to get the same earnings over fewer schemes in order to qualify for payment. If a scheme has a $100 minimum payout, and I only earn $4 a month – it’s going to be a very long time before I get my first payment. In the event of closing an account, if the balance doesn’t meet the minimum payment amount, they won’t pay your commission! I think this is a disgrace, but I got this answer both from Media.net and from CPADNA who would not pay my commission balance when I closed my account with them after finding that it wasn’t a good fit for me. Plans for April – I’ll be back to work during April and May. I’m doing an 8 week temporary contract with my old employer to cover for a colleagues extended vacation So I won’t have much time for blogging, sewing, advertising, etc during these two months. Therefore, I’ll be writing posts ahead of schedule, not responding so quickly to emails and comments, and won’t have time to link up to linky parties to promote my posts. I’ll be leaving all advertising on auto-pilot. Sign ups to my newsletter have steadied and most readers will be now have their initial advertising in place, so any introductory commissions should drop off to near zero. But I will be trying to give more consideration to SEO with my posts so perhaps Google will reward me with some steady traffic. Thanks for also sharing this post at the Pinterest Power Party! I’m always so inspired by your reports. My income is very slowly climbing, and I appreciate your openness so I know how to expand. Thank you! What an interesting post. So many bloggers discuss making money, but few are willing to provide real numbers. Thanks for the honesty and encouragement. Thanks for sharing what you make! I need to start looking for ways to monetize. That’s amazing! I’m going through your newsletter archives and implementing your ideas into my own blog. Thanks for your help! I do have a questions. I just signed up for infolinks and I saw that you don’t put them on your blog until 2 weeks later. How do you do that? I couldn’t find the option anywhere on the website. Thanks! I clearly don’t have enough blog traffic to reach the payout numbers you see each month, but it’s growing a little a time. I’m glad to see that you put yourself out there for those of us who often wonder what accounts to try. Thanks! Wow, That is amazing. I never knew there is a chance to make that much money on blogging! I’m super new to the blog world, and this is so encouraging. I don’t have anywhere NEAR “thousands” of visitors (I was thrilled a few days ago when I broke 100! ), but I can see the potential. First child due in June, which means soon after that, I’ll be a SAHM! Luckily, my hubby saved and saved so I wouldn’t have to work, but it’s good to know this an option if I want to try making a little extra! This is such valuable information. Thank you so much for sharing! Please consider following my blog, http://hoybycrafts.blogspot.com. Thanks! Wow, Deby! You are doing awesome! I would love to know what ShareASale affiliates you use. So happy you linked up to Give Me The Goods Monday! Can’t wait to see what goods you bring next week! A lot of us are out there are looking for ways to make a little extra money, thank you for being so open and helpful on how you do it. Thank you so much for sharing with Saturday Spotlight. Have a great week and come back soon!